Was at the beach today with my husband. 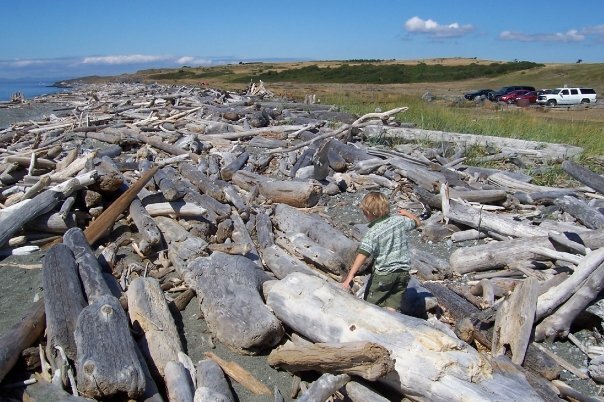 Washington State beaches are littered with logs. The waves and storms throw the logs up onto shore in a kind of tiddelie-winks sort of mess. As we were jumping logs to get ’round from one beach to another I had a thought. As a kid growing up here you’re “baptized” by the oceans and beaches! Most good Washingtonians will take their kids camping on or near the beach. Kids have to learn how to walk on the logs, negotiate good places to step, ask themselves, “Is that log stable?” After many trial and error jumps you learn quickly. This was my childhood every summer. My parents would take us out to Ocean Shores (near Forks & Aberdeen) and we did jumped logs and even made forts out of them. I was deep in thought over this childhood skill and asked my husband how he thought that affected us as adults. Did it give us better judgment? Did the experience cause us to be more circumspect when making a decision? He answered with a question. What about a child who lives in the city and has to figure out the bus system or subway schedule? What sort of enhanced sense of judgment did his environment produce? I immediately thought about my mom and her mid-west upbringing. Living on a farm, getting up before the sunrise to milk cows, feed chickens then get ready for school. My mom and all of her sisters grew up to be hard workers. They have strong work ethics. What experiences did you have that you feel where a positive influence on whom you are as an adult? What shaped you into the person you are today?